aquazone, aquazone, ScrubbyDick and 8 others like this. No need for that heater if its a shrimp only tank, might clean up the look a little with less equipment in there. Mike16T, Mike16T, thotta and 1 others like this. I gets really cold in our office so I had to put a heater. I tried no heater and shrimps and plants did not like it. With a small tank like this, temperature swing is more often..
My little 5.5 drpos below 70 from time to time, shrimp and plants are fine. Between 58 - 65 from time to time.. I haven't seem to notice the temperature droppage in our office recently so I might remove the heater. I'll probably give it another month and see..
Quagulator and Quagulator like this. I assume you are aware of this but just letting you know, if there isn't sufficient light Anubias Pinto/White will generate more chlorophyll and lose the white color completely. Watercrayfish and Watercrayfish like this. what light is that? how does it grow? Sarpijk and ScrubbyDick like this. I love the little dudes. 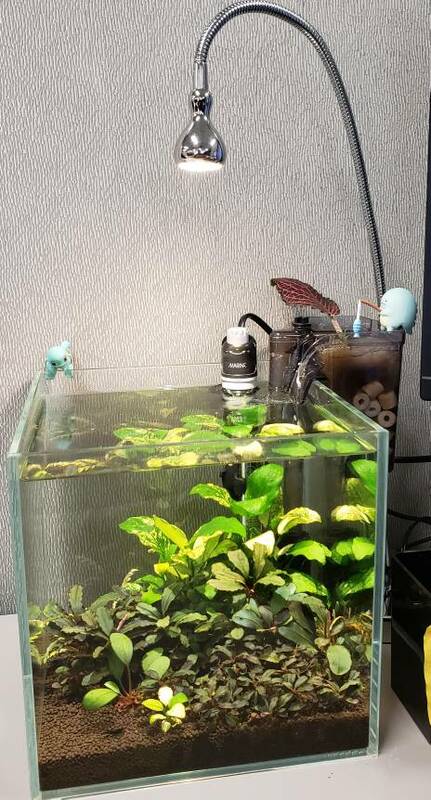 What plant is that growing out of the filter? Is it your home office or office office?